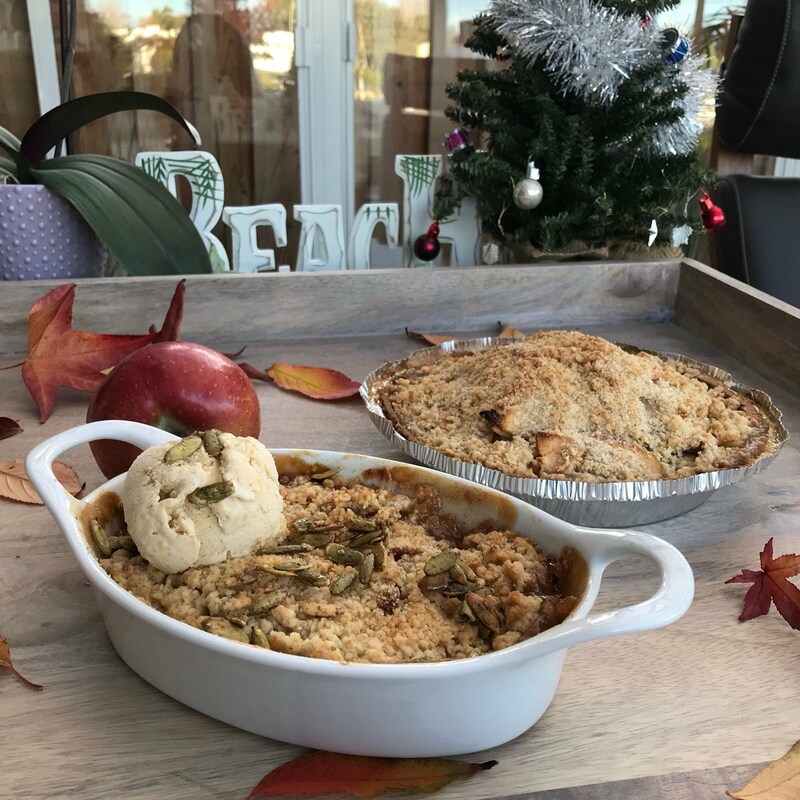 This Thanksgiving, I created the Apple Crumble and Pumpkin Ice Cream recipe to incorporate the best of apple and pumpkin pie into one dessert on our dinner menu. 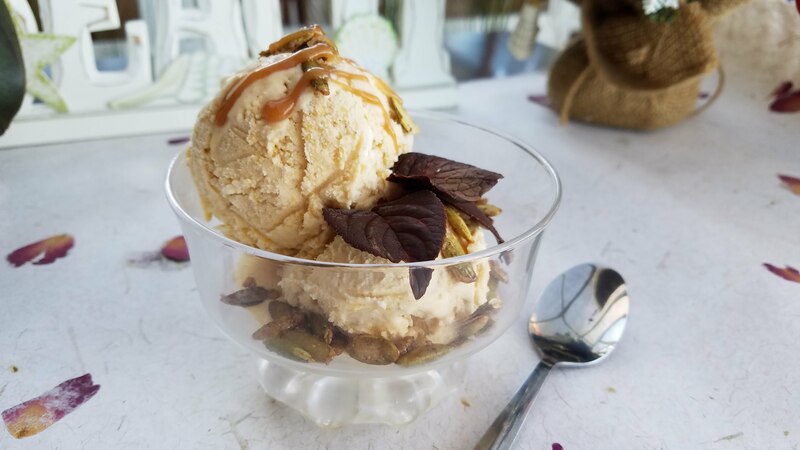 The pumpkin ice cream turned out to be the star of the dessert ensemble. In this recipe, I attempted to make the chocolate leaves and pumpkin puree from scratch. Making chocolate leaves took a lot of patience and delicate handling. I used mint leaves and leaves that I picked from our cherry tree, they are softer so that you can peel them off the harden chocolate easily, otherwise you will end up with lots of chocolate ‘chips’ instead of leaves. Making home-made pumpkin puree however is so amazingly easy. Try it, and I am sure you will make it again and again when pumpkins are in season. Dark chocolate. The amount depends on the number of leaves you want to make. Mint leaves, washed, and pat dry with a paper towel. Line a baking sheet with parchment paper. Arrange a few chopstick on the parchment paper to hold the leaves. Using a paint brush, paint the underside of each mint leaves with a thick coat of chocolate. Set each leave (chocolate side up) against the chopstick. Repeat until all the leaves are done. Chill in the refrigerator for at least half an hour. When the chocolate is fully set, carefully peel the mint leaves off from the chocolate. Cut the stem off the pumpkin. Split it in halves and scoop out the seeds and fibre with a spoon. Line a baking sheet with parchment paper and place the pumpkin halves, face-side down on the baking sheet. Bake for about 30 minutes until you can poke a knife through the pumpkin easily. Scoop the flesh into a food processor and puree till smooth. Remove the puree and set aside. Chill the bowl of a standing mixer in the refrigerator. Mix all the ingredients except the heavy cream in a medium size bowl until well combined. Whip the heavy cream in the chilled bowl until stiff peak forms. Fold a third of the whipped cream into the pumpkin mixture until blended. Fold the remaining whipped cream into the pumpkin mixture until fully blended. Transfer to a container, cover with a plastic wrap over the cream and freeze until ready to serve. In a large skillet, mix all the ingredients together. Cook over medium high heat until sugar caramelize and the pumpkin seeds are lightly brown and coated with the caramel. About 7 minutes. Transfer to large pan and spread out the pumpkin seeds to cool completely. Follow Directions for Dutch Apple Pie. Leave out the pre-made pie crust, and bake the filling in an oven-proof dish. 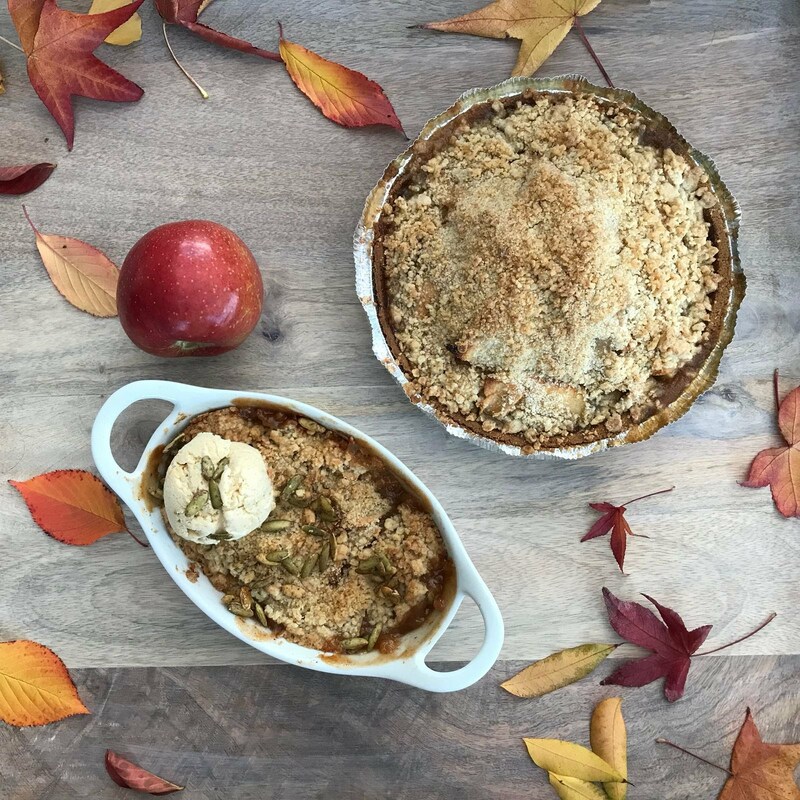 Serve the Pumpkin Ice Crem over apple crumble, sprinkle the pumpkin seeds on top and decorate with the chocolate leaves.